Woohoo! I seem to be among the living today 🙂 Woke up at 10:30 this morning. Can’t remember the last time I slept that late. Really needed it! Did a sleeping around job last weekend. I’m not used to it anymore and it has taken all week to recover from the jet lag. To start with I saved the peels and cores from my dried apple project. I boiled them for about an hour and then strained them through a tea towel. The red from the apple peels made the towel look yucky, but it made the prettiest juice! Then I measured out 4 cups of juice and 2 cups of honey. The recipe I found called for equal parts of juice and sugar, but honey is about twice as sweet as sugar so I reduced the 1:1 ratio to 2:1. I cooked the juice/honey mixture down for about an hour because honey doesn’t set up as easily as sugar. Then I brought the mixture up to 220 degrees by bringing it to a rolling boil for several minutes while stirring constantly. Then I poured it in jars. And put hot lids and rims on. Yes! Those are Tattler lids there 🙂 I finally took the plunge. This was my first time trying them out. They didn’t seal with the first batch. I think I may have tipped them bringing them out of the canner so some of the jelly got under the lid, but the second batch did fine. I’m so excited to have reusable lids for my personal stash! They cost too much to use if I may not get them back, so for gifts and markets, I’ll continue to use the metal one-time lids. After a 5 minute boiling water bath, I started hearing pop, pop, pop! What a beautiful sound! Guess what people are getting for Christmas this year? 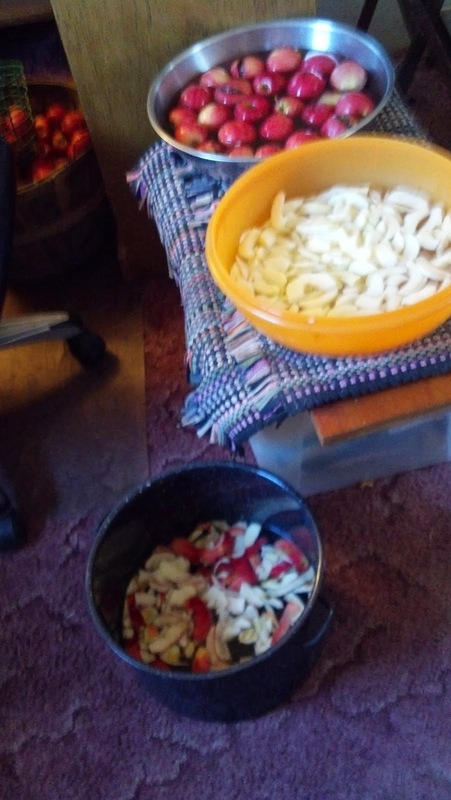 Got up at 6am on Saturday morning and started working on apples. 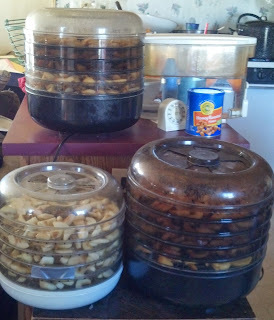 I made applesauce, dried apples and apple peel juice for apple peel jelly. 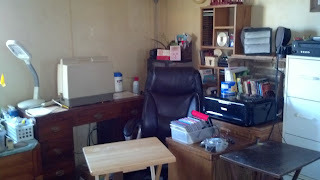 I wanted to do this on Friday because I generally need 2 days in a row to finish applesauce, but Grampa Tom got all excited because I told him I was going to get rid of the ancient desk top computer when the copier from my assessing job went bye-bye. I left the picture blurry on purpose. It depicts my feelings about the entire mess and the clear picture would be just too scary! But I did wind up with a nice functional workspace that even has a home for my sewing machine that has been homeless for more than a year! 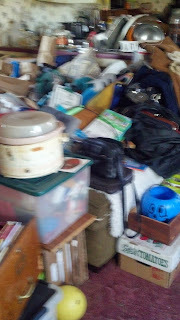 To bad there are still 3 big piles of stuff I need to go through! My goals for next week? Find the futon, the couch and my kitchen table and finish the apples … Oh, apples … that’s where I was going with this wasn’t it? See how badly I can get distracted? It’s all Grampa Tom’s fault. I also fixed lunch and put 6 butternut squashes in the freezer. Grampa Tom came in from his early winter nap at about 3 pm and claimed to have done the dishes that morning … Hmft! No trace of evidence that any such thing had happened in my kitchen! It’s 9pm on Sunday as I write this. 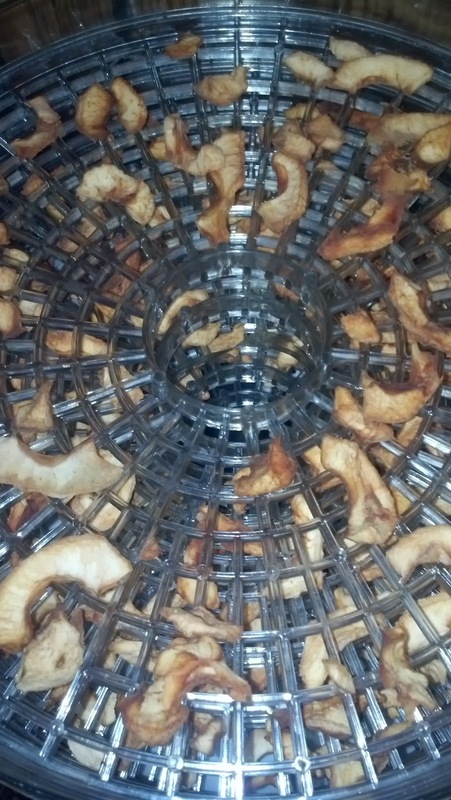 The apples have dried. The applesauce is still in the fridge waiting to be smushed. 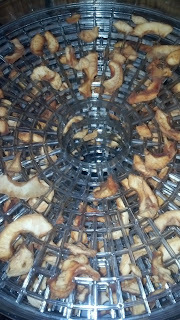 The apple peels are also there, draining their juice into a pan for jelly. 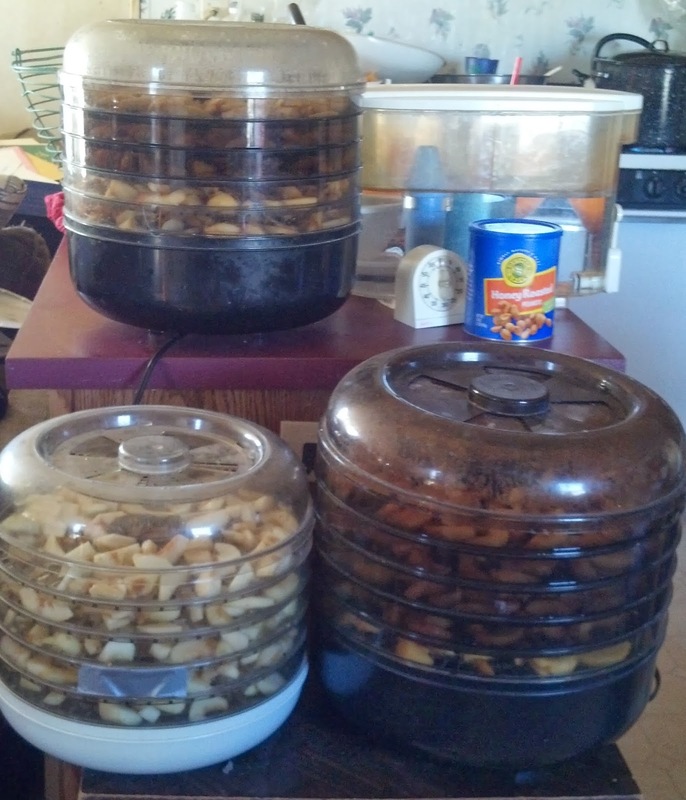 There is still about a bushel of apples left to go. Until I can sneak in another post in the midst of this chaos!